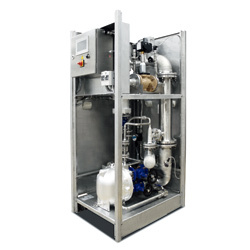 SteamAqua is a compact, instantly connectable water heater that combines TLV’s best practices in steam and condensate handling. SteamAqua heats water quickly and precisely using conditioned dry steam supplied by a CV-COS. The unique condensate pre-heater option further reduces water heating time and optimises energy efficiency. 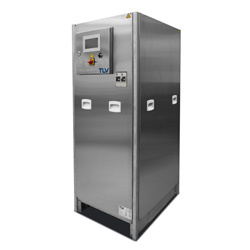 SteamAqua also has a built-in TLV PowerTrap, which promptly discharges condensate under all load conditions to ensure stable operation, and a reliable, easy-to-use touch panel. Journal Article: "Starting Hot Into the Process"